The Kayalu KLA-5001 Eyebolt Kit provides do-it- yourself installation of a small eyelet on your kayak, canoe or boat, allowing your Kayalu accessory (Kayalite, Kayacam, Kayaball, Kayapod) to be easily secured to and detached from any surface currently lacking an existing point of attachment. Hardware in the KLA-5001 Eyebolt Kit, specifically the eyebolt, nut and washer, are of premium grade stainless steel (Type 300 and Type 304), appropriate for saltwater or freshwater use. The supplied rubber wellnut expands as the eyebolt is tightened, anchoring the eyelet to the point of attachment. The supplied stainless steel nut is not required for installation, but may be used to raise the eyebolt if it is being installed on an area of the vessel that has limited clearance underneath for protrusion of the 1" threaded portion of the eyebolt. 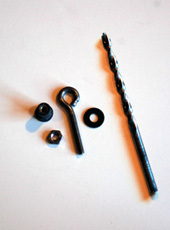 The supplied 5/32" drill bit is provided to create a hole for the 1/8" eyebolt. Installation of this eyebolt on the stern or bow of your kayak, canoe or boat requires drilling of a 5/32" hole (drill bit provided). Eyebolt threads are 1/8", with a thread length of 1". An optimal point of attachment should be determined prior to installation. The upper surface should be relatively flat around the point of attachment, to support the 4" diameter base of the Kayalu accessory. A slightly contoured surface of a kayak's deck will be properly cushioned by the accessory's EVA foam base. If installing on a boat deck, the thickness of the drilled surface should not exceed 3/4" to allow for extension of a minimum of 1/4" of threaded bolt beneath the surface for proper attachment to the wellnut. A thinner drilled surface, such as on kayak, must have adequate clearance below the surface to allow room for the protruding portion of the eyebolt and the attachment of the wellnut. Secondly, the hole should be set far enough back on the stern to avoid personal injury by accidental contact with the protruding portion of the eyebolt beneath the surface of attachment.